A gift box of chocolates arrived for Christmas, and admittedly I wasn’t to excited about getting organic chocolates. My experience with organic chocolate hasn’t been pleasing. Most bars are bland, or chalky. In fact, I didn’t even try any until last week. That’s 2 full weeks of ignoring chocolate for those of you keeping score at home. So, imagine my surprise and delight….The milk chocolate bar from Full Circle Exchange Chocolate is undoubtably the best organic chocolate that I’ve tasted. Made with 41% organic cocoa, it tastes like a Swiss or Belgian chocolate; smooth with a nice snap. I am on a mission now to find where I can buy this retail. I may have to go online and order more. It’s really that good! There are other varieties in the gift pack and I’ll let you know of more favorites as I discover them. This company is a fair trade company and you should read about it on their web site. 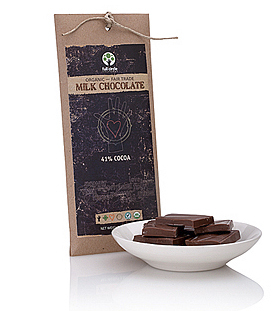 Even better, order some chocolate, and help improve the living conditions for the growers, and producers. You will be rewarded with an excellent chocolate bar and feel pretty darn good about helping others help themselves. And best of all…they are from my home state of Idaho! Image from Full Circle Exchange web site. Posted in Milk chocolate, Organic. Bookmark the permalink.